This is the long design which is 6' Long by 4' High, made using Cedar wood. Choice of colour and of straight or curved side bars. 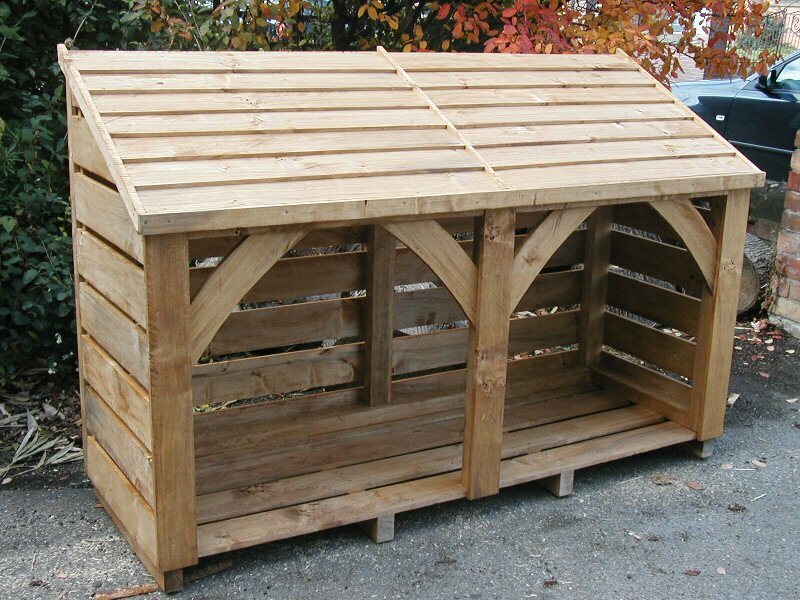 £495 includes free standard delivery, full construction and treating of the Log Store. Individually made and designed with a sloping overlapped roof so rain falls off, with slated bars for good air flow. Under the roof we put a layer of waterproof sheet roofing for added protection from the elements. 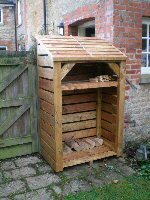 This log store will take up to 60cm (24") depth of logs and kindle, approximately 3 rows of 8in logs or 2 of 10"-12". It stores about 1 cubic mtr of logs. Add a kindling shelf to either side for £45. Depth approx 24" (60cm) internal, external approx 26" (68cm) including roof overhang. If you need this to fit a specific space, please let me know so we can make sure it fits. While this is treated with preservative as standard, it can be left untreated if you prefer, for example if you intend to paint it. It can be treated either Cedar, Light Brown, Dark Brown, Ebony or Clear. Please check the home page for our current lead time. We really do make each one individually to order. If you are having a fireplace built or gardening work done and have a specific date in mind please ring and we will try to help. Unless we make arrangements with you someone will need to be at your property to accept and check a Pallet delivery, and you need two people to move the Log Store to where it will be sited. The pallet company only deliver to the property, they do not help you to put it into place. For Local delivery, or if we are able to deliver it ourselves further afield, we will either site it with you, or leave it where instructed if you are not able to be in. Delivered fully constructed and treated, ready to use, on a full Pallet, you just need to unscrew the batons and take off the cling wrap. Choose the day you want delivery, then the pallet company deliver between 9am and 6pm that day. You can upgrade to a timed pallet delivery (timed any time between 10am to 2pm delivery slot) Monday to Friday, costing £18, or a Saturday morning delivery is £35 . If we deliver ourselves we will be able to gave a choice of day and time, including evening and weekends at no extra cost, but please check with us first if we can deliver to you; if you are within about an hour or so from us we definitely will, and occasionally we deliver up to a couple of hours away, especially if you need an evening or weekend timed delivery for example if no-one is in during the day or you need help putting the log store in place. For all Islands and these Postcodes it will be sent by pallet and there is a delivery charge, at actual cost. Please send me your postcode so I can get a quote from the delivery company. AB10-56, DD, DG, EH, FK, G, KA1-26, KA29+, KY, LD, LL32-37, ML, PA1-19, PH, SY3+, TD, TR, IV1-11.